Reflections of forthcoming India Nepal Tour from Uncle Rommel | Realise the World! Uncle Rommel is the well respected and much appreciated husband of Sadhana Didi. His ancestral home is the Northern areas of the India bordering with Nepal. 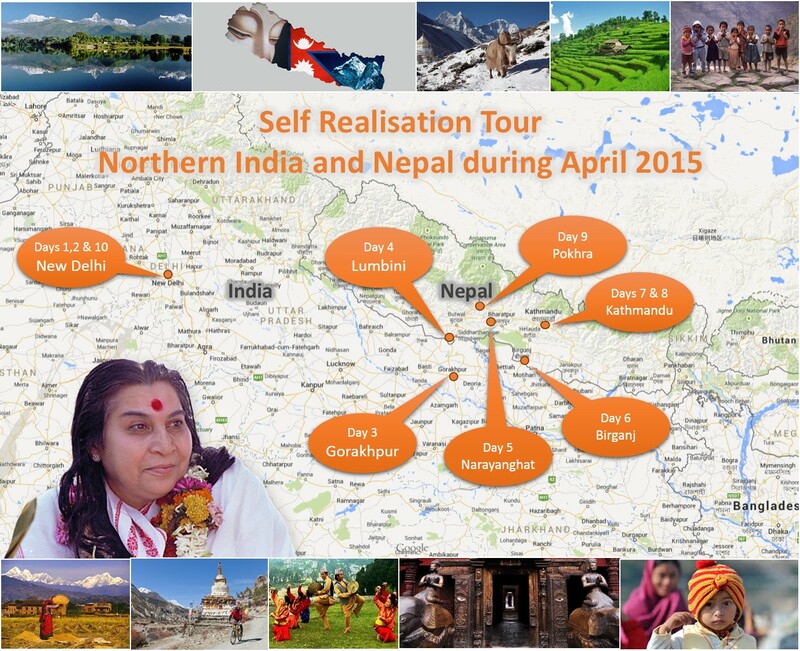 When the possibility of a Sahaja Yoga tour to this region of India was checked with all the other countries for Sahaja Tours in 2015, the India/Nepal tour was coolest on vibrations. Uncle Rommel has been instrumental in putting together all the arrangements for the Tour for which we all thank him. Included below are his spiritual observations of key aspects of the tour providing insights into the deeper aspects of these sacred sites for your enjoyment. The India/Nepal tour will start around April 4th and end around April 16th, 2015. Read more about the tour. “I am doing this as having experienced this part of the world personally and having been alongside Shri Mataji as caretaker on three trips starting soon after our wedding in 1971. The Ganges River begins where two rivers join and is known as Devprayag (where Lothar is building a Centre); this River Narayani too begins similarly at Devghat and flows down to join the Ganges at Patna. It is around this river that Epochal events have taken place – touched by the lives of Mahavir, The Buddha,and Gandhi who established ‘Ahimsa (non-Injury) as a Way forward in Every Sphere of Human Lives’. Similarly, you have chosen the same magical route to bring about ‘Vibratory Awareness’ in people’s lives. Mother repeatedly took some names in this area. 1. Sita of the Ramayana. Now that you are being booked by Air, you will pass the City of Ayodhya where Ram and Sita lived after their Divine marriage. In some ways, the idea of marriage in Sahaja Yoga seem to be patterned on the high ideal of cosmic Unity which this couple exemplify. Both these names concern the popularizing of the traditional system of Indian Yoga from 12th century AD and onwards. Matsya means ‘Fish’ and by extension Movement. This is the natural state where consciousness gropes restlessly. Gorakhnath taught a way of living in ‘this world’ partaking of its many faceted beauty yet remaining unattached but in ‘Balance’. Shri Mataji would always be fascinated by these Greats of the Indian system, talk about them when little was known, and much of Sahaja Yoga as we know of seems to include their teachings, which really shows a kind of Revelation building up in Mother in the early seventies. You will be staying in Gorakhpur and visit a major temple complex in his name which historically is not authentic. In fact Gorkha near Manokamna, is the real place but a bit too much for your packed itinerary. I would request you to make a small guide based on Shri Mataji’s love for this region, their historical contexts and the Vision with which you will be travelling as ‘Yogis on a Mission’ with your enlivening Music & Spiritual grasp. This could help all the Yogis on tour prepare themselves check out the Internet; we can all learn from each other and add to the value of the trip. I would request that the touring Yogis party stop for an hour at Deoghat. A few kms north of Narayanghat and about 1 hour from Sauraha on way to Pokhara. This is where the Narayani River originates and has great significance on the Kundalini of the Earth as every Sahaja Yogi will easily configure and understand. It is a very valued teaching of Shri Mataji and that is why She was so fond of Nepal and visited it a number of times. When you look at the landmass of India, it is in the shape of a DEVI with the Head crowned by the Himalaya. There are 3 rivers that flow down, and looking South: 1 Ganga (FM) on the right 2 Brahmaputra (M) on the left and in the CENTER is Narayani (FM) in Nepal and (Gandak M in India) so both M&FM have combined to make this the flow of SUSHUMNA of the Earth. Shri Mataji would always created the shape of the human Brahmarandra as a Himalayan mountain showing it by joining the two palms of her hand, and thereafter showing the flow of Chaitanya from the 2 sides of the Brahmarandra . This image duplicates the context of human Kundalini with that of the sacred earth and it would be worthwhile to sit in Meditation at Deoghat for 20-30 mins. The second thought connected with this revelation of Shri Mataji is to allow the party to go up a hilly knoll about half hour from Hotel in Pokhara and soak in the unimpeded view of the grand Himalaya from where the great Narayani the Sushumna of the earth arises. Another 20-30 min meditation early morning would be very beneficial for Sahaja Yogis. If this suggestion finds favour with the team and their organisers then departure from Pokhara would be slightly delayed until 11:30-12:00pm and then halting at Manokamana makes sense. The valuable inputs from this group will also strengthen the idea of a Sahaja Yoga ashram somewhere near Narayanghat on the River Narayani in the near future. And Yoga teaches with drawl from the world for restraint of the senses. This is a historic decision and the journey will be specially blessed as you will be walking the footsteps of Shri Mataji.